Self-builders may think of the staircase and windows as little more than an embellishment on their home but these items are as important as any other part of the build. The style of the window must be in keeping with other houses if you are building in an already established area. Some local councils are very hot on this subject where as others can have a more laid back attitude. Staircases, if they are of a special design, must be passed along with the rest of your plans. All staircases must be safely anchored and of the correct height in step. The steep steps in older properties are no longer used due to the steep steps so keep this in mind if recycling a staircase from an older property. Open steps can also be a danger to children and those whoa re not so steady on their feet. All staircases must have banister and hand rails fitted before the building control department of your planning office signs off the house. It may be a minor part of the build but is considered important. 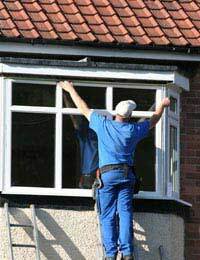 Consider fitting triple glazing, rather than double, when installing the windows. The extra insulation will be paid back with lower heating bills and better protection against the cold and wind. Spiral steps may look attractive but consider if they would be practical? How can you carry large items upstairs? Are there people in the household with mobility problems? What about young children, these stairs can be tricky for little legs. If you need specially designed stairs and windows remember to order them early in the build. Delays with these items can lead to hold ups in completion and stage payments. Do you have a loft area that may at a later date be turned into another room? Ask your architect to design a staircase in the house plans rather than submit plans separately at a later date. This will be a big saving both financially and in time. In the event of fire how will you or your family get out of the house if you are stranded on the first floor or higher? Consider fitting several full-length windows that are large enough for an adult to climb through. Fire ladders can be purchased that can be thrown from the window to aid escape. Ensure all windows have locks as this will not only add to the safety for young children but should comply with your contents insurance. Window surrounds can come in a choice of materials depending on the style of your home and your personal taste. Hard wood window frames look very good but will need maintaining whereas white UPVC need little done to them apart from cleaning. Consider fitting a lift to other floors if there are elderly people in the home. This may be more viable than fitting a stair lift at a later date. Small lifts can be commissioned for home use and can be quite unobtrusive. Are you considering carpeting the stair area? When a new staircase is fitted it may be worth considering staining the steps rather than hiding the beautiful hardwood.